Nervously, Stanley took a sip of the gin and tonic which had been served to him by the manservant, Wilfred. “Well, I suppose,” he cleared his throat. “They started a few weeks ago now, I think. I can distinctively remember that I slept well over Easter and...,” he paused trying to calculate just how long it had been since he last had a decent night’s sleep. “And?” asked the pleasant young man standing at the window of the elaborately decorated room. Stanley observed the rather eccentrically dressed gentleman. They were probably about the same age. He was not one to judge, but he doubted the fellow could wander far without causing disquiet with his manner of dress. Stanley liked to keep abreast of fashion just as much as the next man, but even so, hair that long was one step further than he would ever wish to go. “Pardon?” asked a startled Stanley, somewhat embarrassed by the generous smile the other man bestowed on him. Stanley felt himself blush. He nervously stroked his fine facial hair before taking another sip of the satisfying drink. Now would be a very good time for the ground to swallow him up. Stanley fidgeted for a moment or two and then sighed. “It’s about a woman.” His pulse quickened just thinking about her. Stanley felt his face blushing like a beacon. Stanley was a little taken aback to hear this. If he had been a betting man, he would have wagered that the fellow batted for the other side. He was further surprised when the gentleman laughed heartily. “Pardon?” questioned Stanley somewhat shocked. Had his ears just deceived him? “She...the dreams are draining me. Physically. Mentally.,” Stanley hesitated; he was unsure how to phrase what he was feeling. Stanley felt the blood in his face drain. This strange chap may be able to help him after all. Stanley downed the remainder of the gin and tonic and was amazed when the glass he replaced on the table appeared full. The room felt silent. Stanley considered what he had just been informed. How could he possible know this? The young man studied Stanley for a moment before speaking. Edwardina Templeton observed the smartly dressed young gentleman leaving through the side entrance of the RoYds building. Despite having an almost distracted and tired look about him he was undoubtedly attractive. She felt her heart miss a beat and everything around her seemed to grow more alive. Edwardina had experienced such surreal moments before but nothing quite as acute as this one. Wilfred greeted her at the main door of the building. She shot him one of her most spectacular smiles in preparation for the interrogation she had in store for him. Lady Mabel Theawicke joined them in the corridor. Wilfred’s manner suddenly became sheepish. Unfazed, Edwardina continued, directing her question this time at Lady Mabel. “From what I have been able to ascertain from Tashriel, Mr Stanley Birch finds himself in the most tragic of circumstances. I have no doubt that he shall be remembered for his troubles in some way or another for quite a while following his untimely death.” Lady Mabel informed her with relish. Untimely death? Edwardina felt crestfallen. There must be a way to help him and she would work her fingers to the bone to find one. “If I may, Miss?” Wilfred interjected, helping Edwardina to remove her short pink bolero jacket. “Thank you, dear Wilfred,” Edwardina smiled. Lady Mabel thought that she had seen a slight blush surface on Wilfred’s cheeks but dismissed the idea as ridiculous. Edwardina planted a peck on Wilfred’s cheeks. This time he blushed profusely. Lady Mabel rolled her eyes and huffed loudly. Her grey skirts dismissing the pair of them with a disgruntled swish as she proceeded to make her way down the hallway. 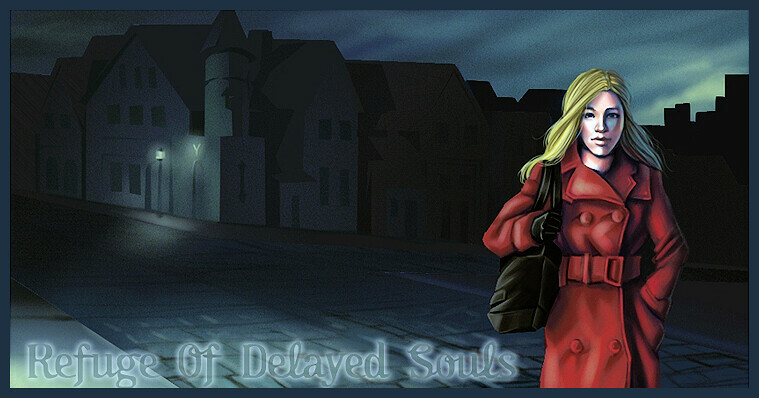 “We haven’t got all day,” summoned Lady Mabel, her chastising voice eerily journeying down the hallway to meet them. Edwardina sighed and unlocked Wilfred’s arm. “Well,” she said merrily. “I wouldn’t say that, would you, Wilfred? Some of us have all eternity!” And with that, she went skipping off to join the target of her mischief. Posted early because readers voted the story to the TOP at http://topwebfiction.com ! Wow, very intriguing. I can see why it got so many votes! I had a character in Cold in the Light say something about how dreams were wonderfully fun experiences until they threatened to become real. this dream of the sensuous woman reminds me of that. I like this very much - especially the Succubus/Lhiannan Sidhe. Give me the creeps - being male! Thought you'd like to know that after the words "Untimely death" Edwardina has been spelt "Edwardian". Hope you don't mind my pointing this out. What! No more? This is the very first Ebook I've actually read 'cover to cover', as it were. Look forward to the next part - I really do! Now would be a very good time for the ground to swallow him up. “To Yeats and others who have crossed their path. The Lhiannan Sidhe gift inspiration to those they persecute. For a short while anyway. Her embrace draws life and breath from you while she grows bright and strong. The madness is just the beginning, followed later by premature death. Even death is no escape." I love Wilifred! And Edwardina's playfulness ... and that Mabel ... she's up to no good! Poor Stanley!